First off, you may have noticed this Henry Lever Action Rimfire .22 Caliber Rifle is not an airgun or a blank gun! So why am I reviewing it? This isn't going to be a review as much as it's going to be an overview. I just really wanted to share this awesome little .22 caliber rimfire shooter with you because if you're like me then you may also appreciate the Henry Lever Action Rimfire .22 Caliber Rifle like I do. One reason I like airguns is because they are generally lower cost to purchase and lower cost to shoot then your average powder burner. My Henry .22 only set me back $269 and I have probably paid more for some of my airguns so this was not to bad on the pocket book. Another bonus is I can shoot this gun all day long because .22 caliber rimfire ammo is about 1/10th or less the cost of regular powder based ammo. I can buy a box of 500+ shells for under $20! When purchasing a rimfire .22 caliber gun, you have to also consider what ammunition you are going to be using as not all rimfire .22 caliber guns will shoot all types of .22 caliber ammo. You can get .22 rimfire ammunition in "Long Rifle", "Long", "Short" and even "Buckshot". Keep in mind that not all .22 caliber guns will operate properly with all kinds of .22 caliber rimfire ammo. For instance, autoloaders generally require the "Long Rifle" ammunition to cycle properly. 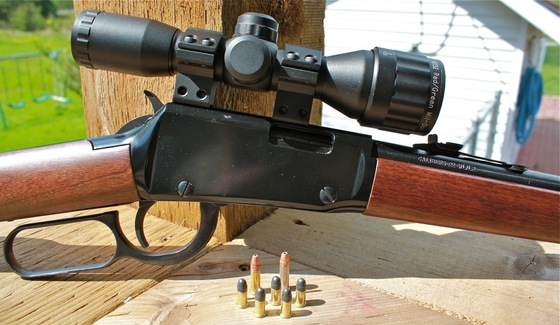 What I love about the Henry Lever Action Rimfire .22 is that it can shoot pretty much any .22 caliber rimfire ammunition you through at it except for the magnum loads which is a totally different gun altogether. Another bonus to using the .22 caliber short ammo is that it is about as loud as a standard airgun, at least when using a rifle. So if you don't want to draw attention to yourself then pickup some shorts and plink away! Depending on what manufacturer of shorts you purchase they tend to shoot in the 700-1000 FPS using around a 20-30 grain bullet, so they are still perfectly good for small pest control. Just make sure to keep in mind what is beyond your target as a 20-30 grain bullet will penetrate objects and travel farther then a much lighter .22 caliber pellet even traveling at the same speed. Shoots .22 caliber rimfire ammunition in Long Rifle, Long and Short. Uses a Lever Action with a tube fed magazine. Magazine holds: 15-LR, 17-L, 21-S.
Has an 18 1/4 inch barrel and is 36 1/2 inches long. Has an adjustable rear sight and hooded front sight with a grooved receiver for easy scope mounting. It's mostly all metal and wood. Is totally fun to shoot and looks awesome! So that's a wrap, if you want more info on this very cool .22 then check out the Henry Website.